More than five years ago, Michelle Call had a hereditary kidney condition that left her unable to work. She often had no energy and was in bed most of the day. Her husband ended up donating his kidney, and she was able to have transplant surgery. “I said if I ever was able to go back to any semblance of a normal life, I would really want to do something that is giving back to the community and making a difference,” she said. When she was back on her feet, Call worked at Visiting Angels, managing caregivers, hiring, and training. She also taught a class for Dignity Health on healthy living. But Call was always looking for something more, something that held a deeper meaning for herself. WORKING TOGETHER Newly appointed executive director of GALA, Michelle Call, is hoping to create a bigger support network for the LGBTQ community. 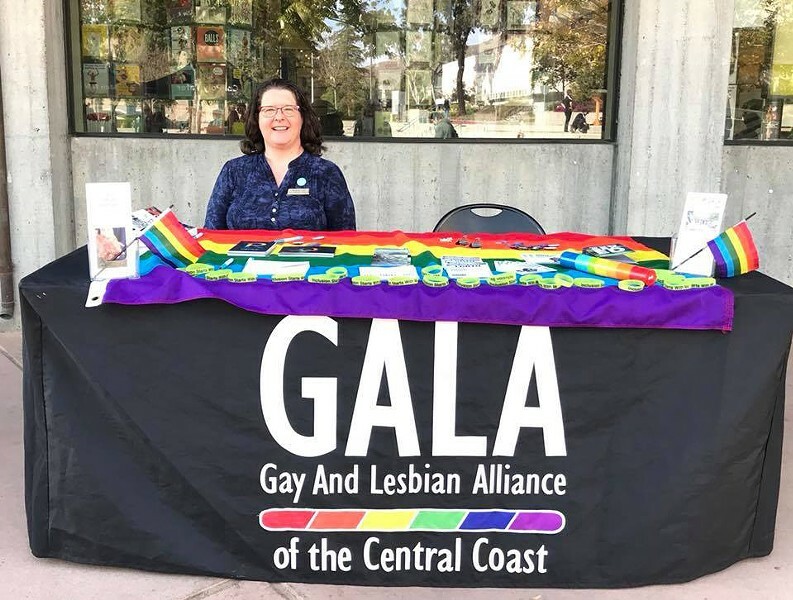 Recently, the Gay and Lesbian Alliance of the Central Coast (GALA), started looking for an executive director to head the community organization. “When GALA advertised for this I thought this is my ultimate dream job. I could be paid to spend all of my time helping the LGBTQ-plus community and really put my efforts there,” Call said. She said that to her, GALA is an organization that is the support system for the LGBTQ community locally. She got the position after volunteering and maintaining a helping presence in the LGBTQ community. “So really someone said to me, ‘You’re like the big gay cheerleader,’ and it kind of really is that,” Call said with a chuckle. She’s been involved with GALA since 2005 when she approached joining the board with her husband and their partner—she and her husband are polyamorous. The couple was turned away from the board, but Call said that she understood why. At the time, GALA was mainly focused on working on equal rights and support for gays and lesbians. Maintaining her involvement within the community and with GALA, Call said that things are changing for the community organization. Among the paperwork on Call’s desk are flyers for other organizations such as the Central Coast Coalition for Undocumented Student Success. One of the goals that GALA has is working with other groups that advocate for marginalized people in the community. Call said she hopes to work with the National Association for the Advancement of Colored People (NAACP) SLO city chapter and disability advocates. “We’re going to talk about how we can work together and what we can do to support each other,” she said. The alliance is also working to provide direct services to its community members in the next few years. It would like to have a therapist on-site, a lawyer, and offer medical testing. “We want to serve the community in a more practical way. We have peer groups now, which are great, but we know that a lot of LGBTQ people cannot afford health care and mental health care. Even if they could afford it, they don’t have anyone to go to that is trans friendly, for example, so they don’t go,” Call said. Along with providing services, GALA is also working on an initiative to increase the knowledge and understanding of LGBTQ mental health needs. It’s called #Out4MentalHealth and engages LGBTQ people throughout California to develop a mental health equity agenda and offer tools and resources that address these disparities. GALA is also seeking to possibly change the organization’s name. A public meeting will be held on July 11 at 6:30 p.m. in the San Luis Obispo Library, where the community can voice their opinion about whether the organization should change its name. “I want to hear about what people want in order to make GALA feel more like their organization, and that’s part of why we’re having that town hall,” she said. Call said the direction that GALA is moving is positive, and she’s ready to help in any way she can. Staff writer Karen Garcia is learning about her LGBTQ community and can be reached at kgarcia@newtimesslo.com.